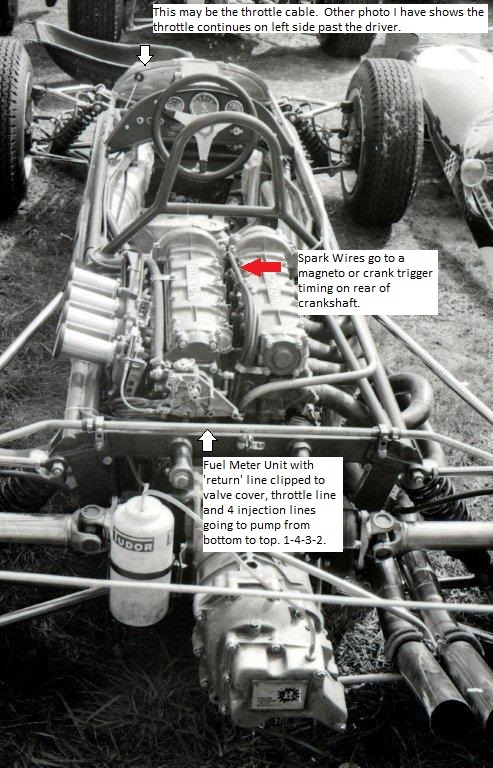 I used a generic description of the motor as its official title RE302E may be confused with the 1968 F1 car. The Japanese model company Ebbro has recently released a very lovely 1/20 scale kit of the Brabham BT 18 Honda F2 from 1966. The kit does not include or show the ignition or the injection lines where they go into the metering unit for the injector or whatever Honda used in lieu of a rotating distributor. The engine, like the S800 motor, did not have a typical distributor. There are additional fuel pump lines I would like to trace as well. It appears that the coolant plumbing is included. 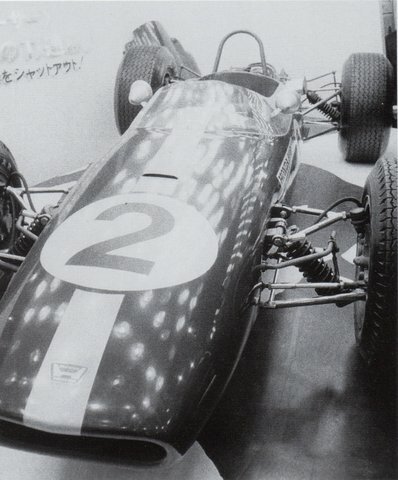 To my knowledge, there is the one complete Brabham Honda in the Honda collection. 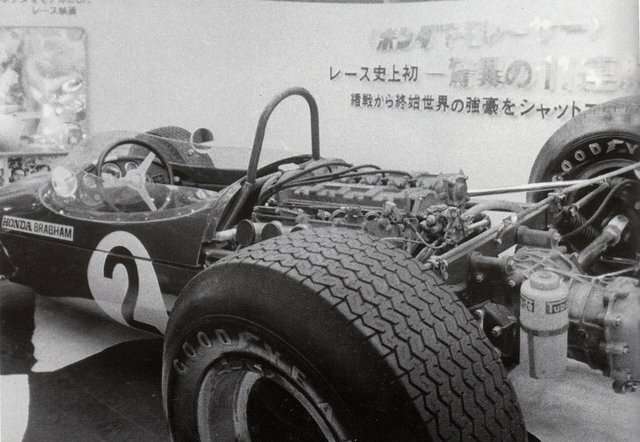 * This car was sent to Honda after the 1966 season. The on-line photos are either showing the car closed in the museum or the exhaust side which does not show the ignition/injection source points. There is a second motor, a cut-away motor in the collection but the on-line photos of it are of the right exhaust side with no lines or wires attached. * Brabham ran two cars. 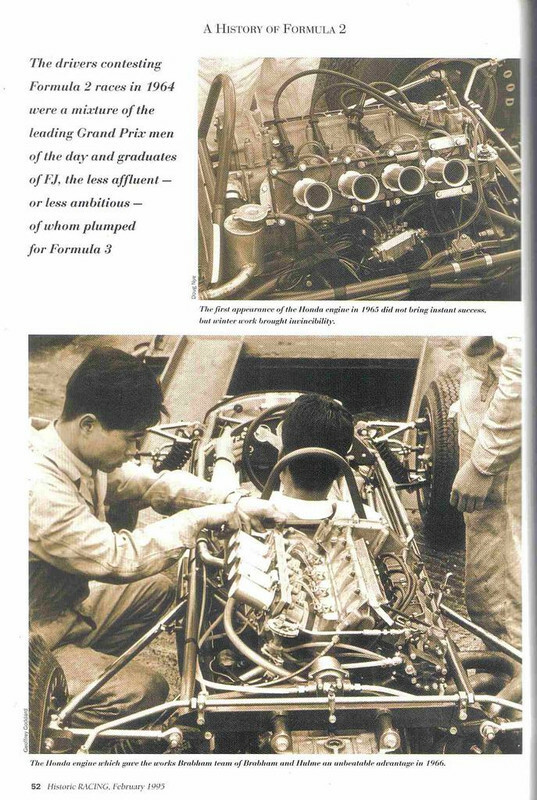 After the 1966 season F2 went to the 1.6 liter formula and Honda left on a high note. (If you see a video of the car, it was a very high note) The second factory team car was recently for sale with a Lotus Twin Cam in. Other BT18's were sold to customers. I assume in 1966, these would have likely used Cosworth FCA or BRM P80's. 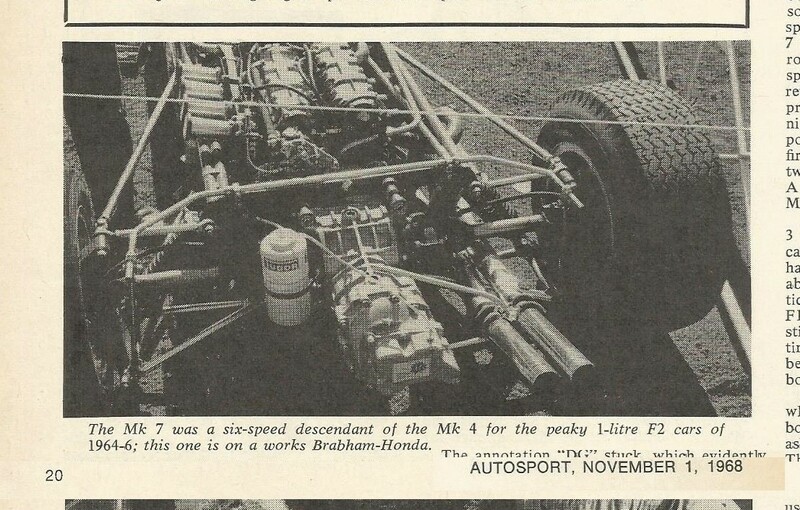 Considering Honda's overwhelming success in 1966 F2, I am surprised not much can be found on this motor. BTW, this motor is very different from that which was used in the BT16 in 1965. Edited by DavidLayton, 06 December 2018 - 16:35. 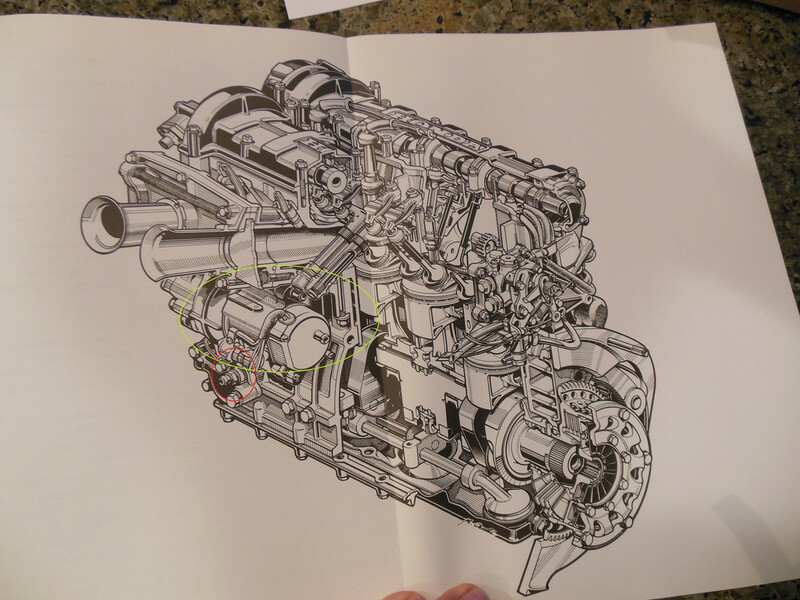 I don't know about this engine but the S800 had a very normal distributor mounted horizontally at the forward end of the camcover and driven by the inlet cam shaft. WHAT ARE THE PAIRED LARGE BOLTS ? It must have had a bunch of compression to justify that size of starter motor! A lovely little engine, there's not much size in that clutch. I seem to recall this engine used torsion bar valve springs. The bolts would possibly be the 'stops' for these bars. 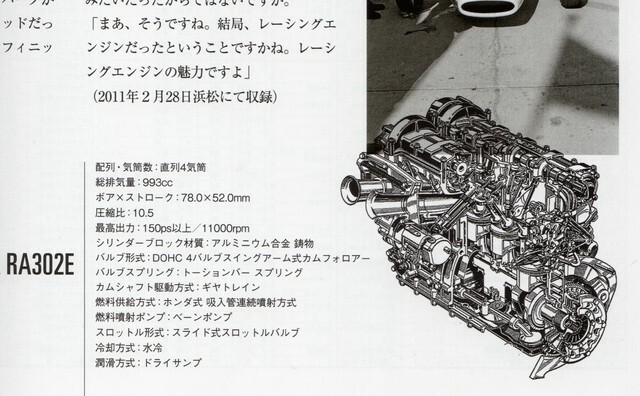 The F2 engine had nothing to do with the S800 unit. For some reason I can't post pictures even though they appear fine in previews. Honda showed one of the cars at the Tokyo Motor Show in November 1966. Apologies for the low quality. 72.0mm bore x 61.2mm stroke. 10.5:1 compression, 20.4m/sec average piston speed. 78.0mm bore x 52.0mm stroke. 10.5:1 compression, 19.06m/sec average piston speed. 'Auto Sport Historic' magazine used a small, uncredited, cutaway to illustrate the RA302E in their excellent 'Honda S800 Racers' magazine/book 'Mook' in 2011 (ISBN978-4-7796-1205-3). 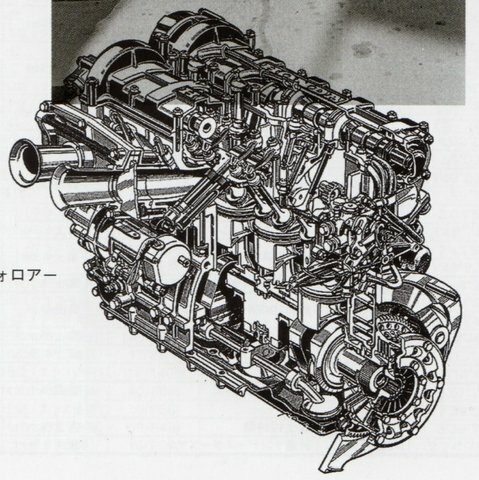 I'm sure I've seen a similar cutaway in another Japanese publication, but I can't find it now. Brabham BT16 F2-11-65 - raced by Jack Brabham in 1965. Unknown after 1965. 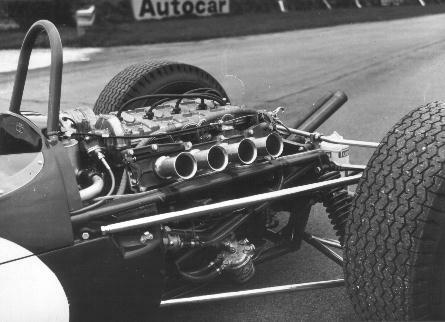 Brabham BT18 F2-19-66 - raced by Denny Hulme in 1966, up to Le Mans-Bugatti in September, then by Chris Irwin in three late-season races. Presumably the Honda museum BT18 that was at Goodwood in 2005. Brabham BT21 F2-20-66 - raced by Jack Brabham from Karlskoga in August 1966 onwards, then sold to John Kendall for F3 in 1967 (again, without the Honda engine). Umm..Could have used it as a generator and additional traction motor too! Yes, looks like they are the end caps for the torsion bar housings...............just wonder how that all worked ? Edited by StanBarrett2, 07 December 2018 - 16:21. I know, I was responding to the original post. What a shame air pressure came along, maybe someone else would have done this? Interesting shot of the show car with the sparkplug wires going forward. This 1966 race car, the ignition wires go back aside the fuel metering unit. This is Denny's car at Pau. Note the silencer. Assume this was needed outside of race times. You can also see the spark wires going straight back in the You Tube Video of the engine being started. Edited by DavidLayton, 08 December 2018 - 16:12. 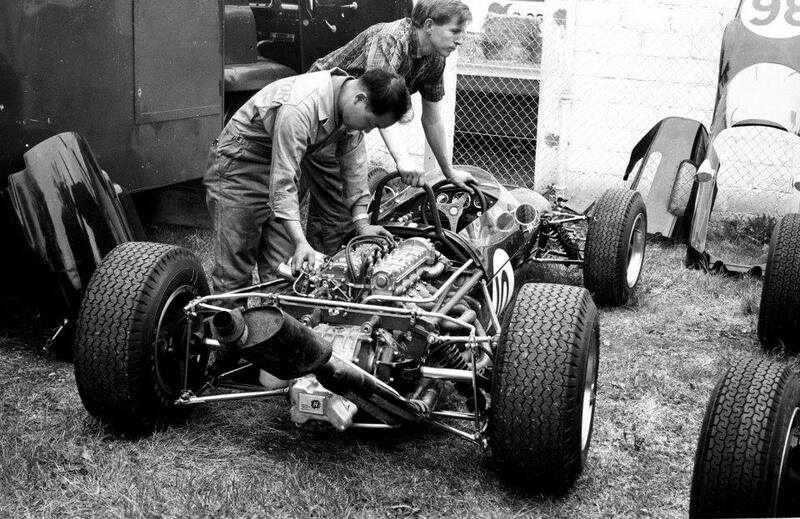 Wasn't the engine installed in the Brabham mule chassis for testing before it went into the BT16? Can anyone identify the gearbox fitted to the car shown in these photographs? I think the perceived starter motor size is an optical effect because the diameter of the exhaust pipes is large too. Ditto for the cylinder head accessory overhang. Which means that the clutch diameter was even smaller than it looks. According to David Layton's photo, the gearbox has a familiar large H label on it. The engine sub-frame compared with that in PZR's photos suggests different generations of chassis. But the car in post #10 is not fitted with a Hewland and also has significant frame differences. Well that explains the wrong direction of the ignition wires. I am very curious as to the distributor that would be at the base of the rear of the block. Interesting to note that this engine appears to be monochromatic as opposed to the metallic gray block and gold head components. I hope to find photos of the operating car's motor and the clear photos from 1966. In addition to the engine mysteries, I hope to find a good set of photos of an undressed BT18 F2 to map the fuel lines between the fuel tanks and the fuel pump. I have the brake lines worked out. Once I have the documentation worked out, I plan to do a build blog on building this kit. Edited by DavidLayton, 08 December 2018 - 18:40. 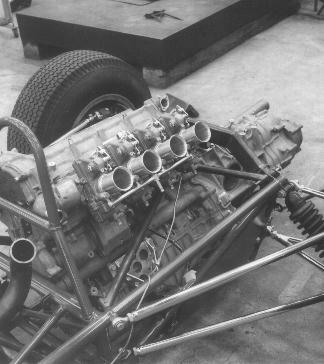 It is usually said that the Cosworth DFV and FVA were first to adopt the narrow valve ange/ 4 valve per cylinder configuration. Others point out that the Weslake V12 was first, but did Honda beat both of them? Good photo. Shows 2 of the 4 injection lines going from the intakes down. I suspect there is a valve panel on the metering pump similar to the Kugelfischer on a BMW 2002tii. The Throttle linkage is the line arcing around the metering unit on the rear of the left cam. As seen in the phot from Pau and if you see the YouTube video of the surviving car being started in the garage in Motegi, the ignition wires go directly back into the undefined. On the video, the wires are aligned in a row rather than in a circle, which makes me wonder if there was a transistor board (it was the 60's) in lieu of a distributor. These go into a covered area not seen in the Pau photo but past the metal clip in the Pau photo. Do we know the firing order, just out of interest's sake? It must be either 1-3-4-2 or 1-2-4-3. Wonder how a pair of these, bored out to 1.5L each, and joined with a common crank would have performed ? All in a package scarcely bigger than the F2 chassis. 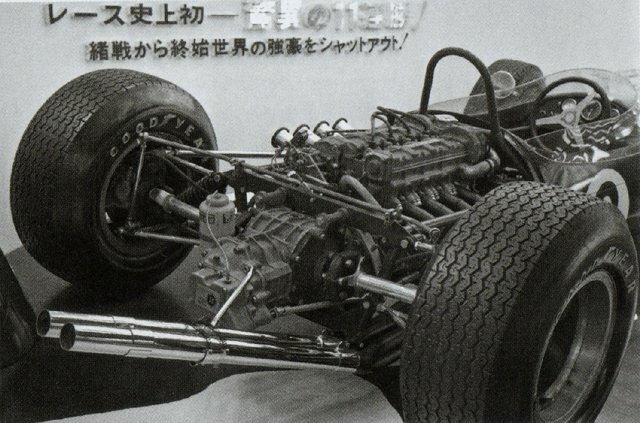 Certainly lighter and smaller then their V12 and Honda (later Hond-ola) package..... Guess we will never know. Here is a bit of a 'money shot' The 4 ignition wires appear to go into the block next to the coolant line. I also see the 4 fuel lines going into the fuel pump similar to the BMW Kugelfischer on the lower right and I found the same part on the kit! The throttle linkage is also very well displayed. I found this on Facebook and it ties to a French site on Monthlery. I can also trace the throttle line to the front pedal bulkhead, the use of black rubber brake lines and the tach cable going to the pick up on the front of the left cam which is a kit part. Edit: Subsequent review of BT18 details show that the throttle line connection was on top of the frame above the accelerator. So I believe the throttle line went past the instrument panel and angled to the accelerator. Wire in front bulkhead may be wire for Temp Gauge. A picture of the model itself. Edited by DavidLayton, 27 January 2019 - 18:01. Still Pondering where the 2 oil lines from the remote filter (on the frame to the left of the motor) that run to the forward right side of the motor or front. The motor is a dry sump with the 2 pipes to the oil tank in the front located on the front right side of the motor running up the right side of the frame. 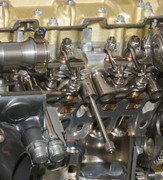 Based on the 1Liter F2 news letter produced by Keith Whittle, there is a cut-away left side view that shows the oil pump with 3 pick ups along the bottom going forward but the two hose connections are not marked. There are also pictures that indicate that the throttle ran along the left side of the frame. Usually, the throttle cable goes back along the right side, if the intake was on the other side, cross behind the driver. However, the photo in a Honda Collection book shows the line going past the cockpit on the left. So was there some sort of pivot device on the accelerator that allowed the cable to go in front of the forward bulkhead before running down the left side? I have acquired a Honda Collection 1 book and while it is in Japanese, I can at least make use of the photos. Attached is one with my notations. Now I may have misidentified an item, feel free to correct me. I admit, I do not fully understand the fuel injection system arrangement. There is a fuel line that runs up the left side frame through the fuel pump and to the metering unit. I would assume this is the fuel to the metering unit line. But there is the thick line that goes from the metering unit along the cam cover to the fuel tank. Is this going in or is it a recovery line? Edited by DavidLayton, 27 January 2019 - 17:50. How about you post the photo here so we can see it? Thanks you forced me to figure out the URL posting technique. From the David McKinney 'Small Cars - Big Opportunities' 1964 - 66 F2 feature in the Graham Gauld-edited 'Historic Racing' Volume 2 issue 2 (final issue). 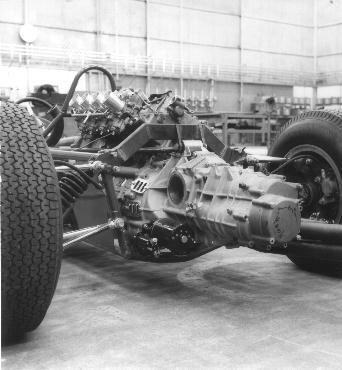 Both of these photos are of the RA300 engine in the 1965 BT16 chassis. 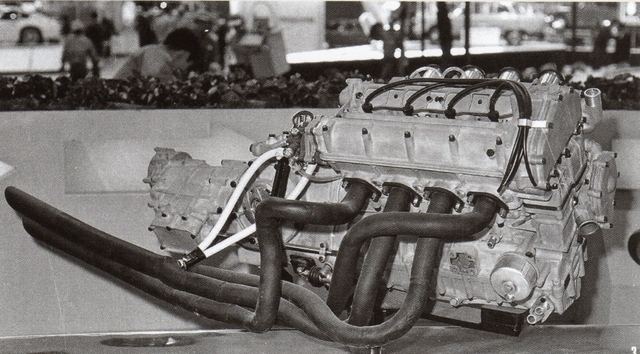 The 1966 engine was totally different and not canted. 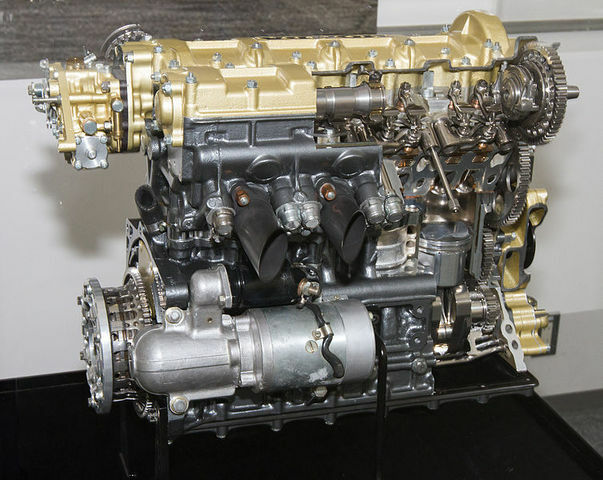 It is interesting to note how much improvement was made between the RA300 and the RA302E, especially considering that the 1966 engine would only have a year's serviceable life. Quite an R&D project. Thanks! That is the kit and it is large enough to call out for the fluid lines to be added. Unfortunately, the modeler was not familiar with the car. The hydraulics were metal lines going to fittings on the ends of the frame with the black rubber covered lines to the calipers. The rear brake line fittings would be on the last frame with a T Junction on the left side lower frame on the line to the master cylinder. If you look a few frames up, you will see a photo of the car in the museum and the notes showing the metal brake lines. The flexible lines fastened at the frame and ran out the suspension in typical fashion and were not lashed to the A-arms. The front were near the rear upper A arm. The lines from the oil filter on that model were going to the injectors. There were two oil lines from the filter to the motor. (shadowed in orange) See Photo. The injection lines would go back to the metering unit. There is also a fuel pump that is incorrectly located on the model in the vertical. Contemporary photos show it on the angle with the line going up to the metering unit. (Pink line) My last unanswered question on that is where the oil filter lines go into the motor. The lines to the oil tank in front are on the right side of the block. There is not a good picture of the left side of the block. Edited by DavidLayton, 31 January 2019 - 01:42. With help from Rob Shanahan, I have the answers to the two unsolved issues on the Honda RA302E motor. Rob confirmed that the Honda's fuel injection was patterned off of the Lucas unit on the SCA and that the thick line channeling along the (driver's) left cam cover is a fuel return line to the tank. The 2 oil lines go from the remote Oil Filter on the Frame to the original location for the oil filter on the block. The placement of the motor in the Brabham's frame required the use of the remote filter. The location is where the red circle is on the drawing. I am very grateful to Rob and Kevin Whittle whose issues of One Litre F2 were very helpful to me. I would also recommend the French Auto Diva site for the 1 litre F2 cars and early F3 cars! Edited by DavidLayton, 12 February 2019 - 22:50. I am very grateful to Rob and Kevin Whittle whose issues of One Litre F2 where very helpful to me. I would also recommend the French Auto Diva site for the 1 litre F2 cars and early F3 cars!